What music would you like to hear just before you die? I'd probably choose something from Mozart or Bach. What could be better? The singing of angels? That is what St Chad of Mercia is said to have heard before his death. On 2 March 672 A.D. Chad, the Abbott and Bishop of Lichfield died. This image of a stained glass window in Worcester Cathedral shows St Chad in the oratory of his house in Lichfield. It illustrates the story of Chad's death as told by the Venerable Bede (673 - 735) in his 'Historia Ecclesiastica Gentis Anglorum'. 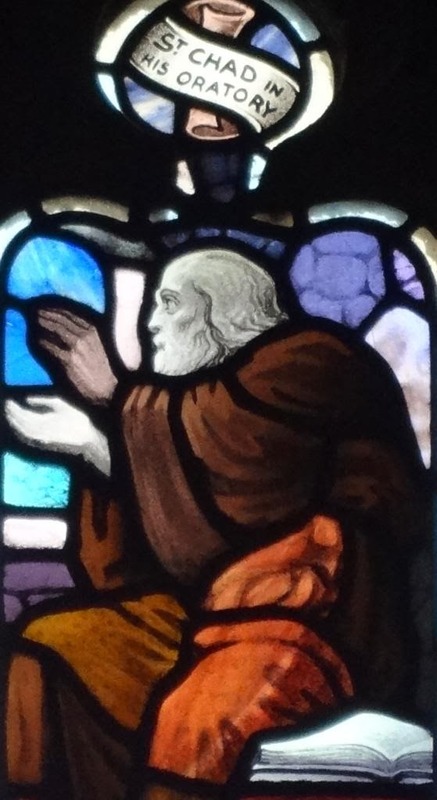 According to Bede many of the church in Lichfield had died of a plague. Chad's habit was to pray and read in his oratory with 7 or 8 of the monks, but one day shortly before his death he had just one with him whose name was Owine and who later told the story of Chad's death. The following is taken from a translation from The Clerk of Oxford's post. "The bishop was alone reading or praying in the oratory of that place, when on a sudden, as [Owine] afterwards said, he heard the voice of persons singing most sweetly and rejoicing, and appearing to descend from heaven. Which voice he said he first heard coming from the south­east, and that afterwards it drew near him, till it came to the roof of the oratory where the bishop was, and entering therein, filled the same and all about it. He listened attentively to what he heard, and after about half an hour, perceived the same song of joy to ascend from the roof of the said oratory, and to return to heaven the same way it came, with inexpressible sweetness. When he had spoken thus much and more, and they, having received his blessing, had gone away in sorrow, he who had heard the heavenly song returned alone, and prostrating himself on the ground, said, "I beseech you, father, may I be permitted to ask a question?" "Ask what you will," answered the bishop. Then he added, "I entreat you to tell me what song of joy was that which I heard coming upon this oratory, and after some time returning to heaven?" The bishop answered, "If you heard the singing, and know of the coming of the heavenly company, I command you, in the name of our Lord, that you do not tell the same to any before my death. They were angelic spirits, who came to call me to my heavenly reward, which I have always longed after, and they promised they would return seven days hence, and take me away with them." Which was accordingly fulfilled, as had been said to him; for being presently seized with a languishing distemper, and the same daily increasing, on the seventh day, as had been promised to him, when he had prepared for death by receiving the body and blood of our Lord, his soul being delivered from the prison of the body, the angels, as may justly be believed, attending him, he departed to the joys of heaven." It is interesting that Owine also heard the same 'song of joy' as Chad. If that is true then it is harder to attribute what Chad heard to an auditory hallucination caused by fever. Some might explain the phenomenon by suggesting the singing may have come from monks in the nearby church. I would prefer to keep an open mind to the possibility that God gave Chad a foretaste of the joys of heaven.